When Emad Davis ’19 considered transferring to Randolph a few years ago, he was intrigued by physics professor Katrin Schenk’s ongoing work developing monitoring devices for Alzheimer’s patients and their caregivers. Now, he’s leading the project and using his coding and software programming skills as part of Summer Research. 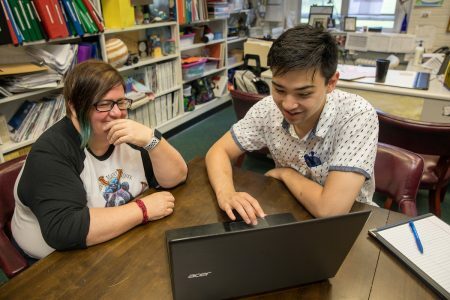 This summer, Davis is creating a prototype of a web application that would be accessible via computer, iPad, iPhone, and Android devices. Similar to a Fitbit, patients wear the tracking device around the wrist, and it sends vital signs and other important data to their caregivers in real time. Davis’s goal is to make the software as simple and user-friendly as possible, especially for those who are less technologically savvy. Schenk said research has shown that staying active is key for Alzheimer’s patients, and the data provided by this device proves it. A physics major, Davis has enjoyed the opportunity to try something new and further develop his skills. “What we’re doing is developing a great idea, and it’s something no one has ever really done before,” Davis said.